The event is presented by Young Ethiopian Professionals (YEP), Society of Ethiopian American Engineers and Scientists and CIPA. New York (TADIAS) — How do you protect your ideas and what is intellectual property? 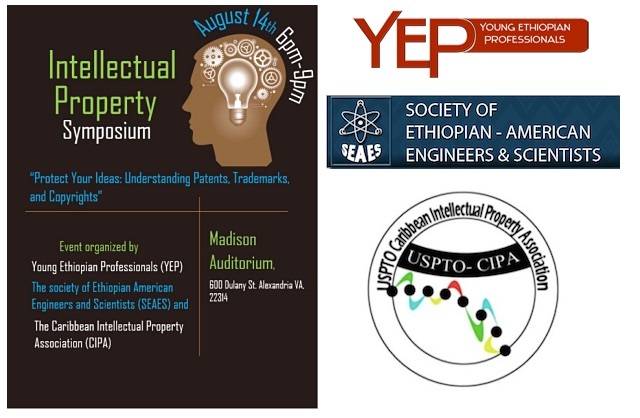 A symposium on the topic is being organized by Young Ethiopian Professionals ((YEP), Society of Ethiopian American Engineers and Scientists (SEAES), and The Caribbean Intellectual Property Association (CIPA). The program, which is scheduled for Friday, August 14th at the US Patent & Trademark Office in Alexandria, Virginia, features expert discussions covering areas of patents, trademarks and copyrights. Speakers at the event include Anthony (Tony) Knight, Acting Associate Commissioner for Innovation Development at the United States Patent and Trademark Office (USPTO); Susan Anthony, Acting Director in the Global Intellectual Property Academy at the United States Patent and Trademark Office (USPTO); and Craig Morris, Managing Attorney for Trademark Outreach.